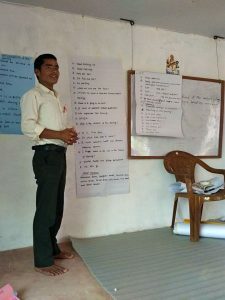 We are delighted to report that the third residential teacher training organised by GMIN (Grassroot Movement In Nepal) has now been completed at the end of April 2017. This was in Bidyapur, Surkhet, Nepal. The 26 teachers (from class 1 to 5) came from 17 different schools to attend the five-day workshop which focussed mostly on English Grammar Vocabulary. The first one we funded was in Babiyachour, Surkhet during July 2016, the second one at the beginning of April 2017 in Ghorahi, Dang. Over 63 teachers in total have attended these workshops.